Do you know what happens to a crime scene after the police have carried out their duties? No? It’s quite simple really – someone cleans it up. Yep – its true – some poor shmoe has to wipe away the blood and the gore, just so life can go on as before. It’s illustrated in this film as a matter of fact, one Directed by Renny Harlin; and Starring: Samuel L Jackson, Ed Harris, Eva Mendes, and Luis Guzman. It was made in 2007, and lasts for 88 minutes. 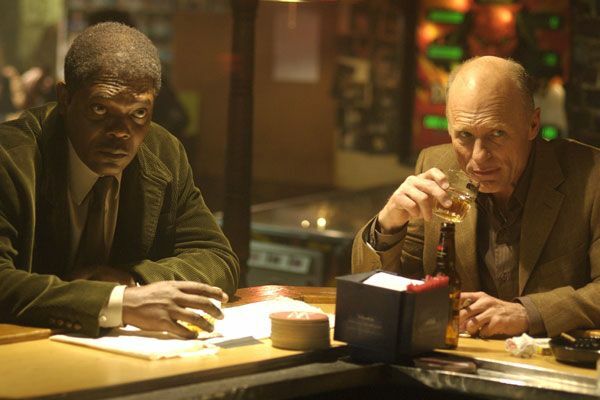 Widowed ex-police Detective, Tom Cutler (Samuel L Jackson), has a hard life you know. He lives with his daughter, Rose (Keke Palmer), whom is pining for her dead mother. He works as a specialized cleaner, disinfecting the debris of disposed human verve. And generally, he has a rather solitary existence, full of trouble and the remnants of the dead. However, one day, Toms troubles turns into confusion, when he goes to a house for confirmation of a job that he previously carried out – cleaning up after a grizzly murder scene – only to discover a number of peculiar facts. For example: (1) The lady Tom meets, Ann Norcut (Eva Mendes), has no prior knowledge of Tom’s clean-up activities. (2) Ann’s husband, John Norcut, has gone missing, and was meant to be called to give evidence relating to a police corruption scandal. And (3) Tom’s past life as a police detective is intertwined with John’s Norcuts present dealings with the police. So what does Tom do about this, huh? Errr – nothing really – he just makes some lame excuse to Ann, and then tries to bide his time by meeting up with an old friend of his at a bar downtown, Detective Eddie Lorenzo (Ed Harris). plus the corrupt cop who is currently investigating John’s disappearance too, Detective Jim Vergas (Luis Gizman). But you know what? Tom can't keep quiet for that long you know - especially when Ann turns up at his office the following day, and queries Tom’s house call. In turn, Tom does try his best to dismiss Ann's query – but eventually, he decides to comes clean to Eddie, and explains to him the dilemma that he is presently placed in. That's great news, right? Because I am sure that Eddie can surly help out both Tom and Anne. Heck, Eddie can even get Jim to help him out as well! Maybe that is why what next transpires is a rather stained affair all in all. As revelations are made - ploys can't fade - lies are conveyed - and cleaning products are sprayed. 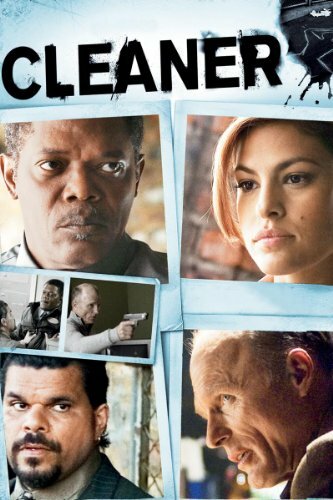 Now 'Cleaner' is what I like to call a good solid film. The story is solid. The acting is solid. And the sets are solid too (sorry, could not help myself). Still, does solid translate into good? Well, from my own point of view, yes – yes it does. And it does that by conveying a pertinent tale which intertwines past loss, present dilemma, and the need to not lie to oneself about family tragedies. Oh! There is also a bit of hard-core cleaning thrown into the mix for good measure – but I find that this is nothing more than a throw away plot device to evolve the exponentially expanding pretext (Hey! “exponentially” – my vocabulary is getting good-er-er all of the time). You see, I found that the best thing about this film (apart from it being solid) was the way that the characters broke the usual movie conventions, and ‘acted’ rather more naturally than the ‘normal’ Hollywood fare. 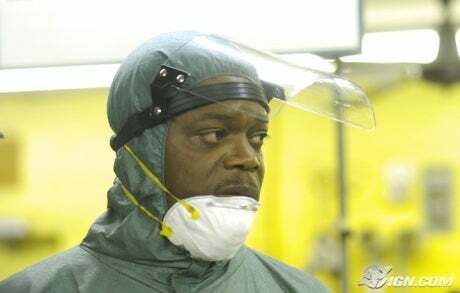 Take Samuel L. Jackson’s character for example (‘L’ stands for 'Lego' by the way). At the beginning of the flick he wants nothing to do with the mystery that he his is involved in. Then he tries to absolve himself by ‘coming clean’. And finally he just lies his way to the end. Listen, I have got to admit, that last bit did take me by surprise when I first saw it within the film I can tell you – Samuel lying. I though to myself that I may have misheard something, or just maybe missed something which might have come before. But no – Samuel lies his way nigh on though three quarters of this movie (if not at least half), clarifying to me one thing – never play him at cards. Another thing that I also liked about this film was the sub-plot involving the dead mother. I found that the scenes with Samuel and Keke ('Keke' mean 'Lego' in Spanish), were really emotionally charged, and gave this seemingly throw-away though-line some grounding for a film of its own. But obviously the main-plot had precedence, and by films-end the two story-strands found a way to converge together in a somewhat fleeting way. Now this is the point in my review where I try to counteract my previous statements, just to give a more balanced opinion. Nevertheless, I just cannot seem to find that many words within me to be negative about ‘Cleaner’ – as it is good. However, saying that though, apart from the silly title (they should have called it 'Lego' instead) I wished that the film could have been a bit more dynamic all in all. In places, the film just plods along on its merry way, telling the story that it wants to tell in a somewhat doddery manner. The action scenes are non-existent. The dramatic tension, though good when it does arise, are scattered sporadically throughout. And the overall pretext, though very good as well, does not seem to conform to a more dynamic tone. Still, these negative factors are not all that important within the scheme of things, because if you like crime thrillers such as 'The Negotiator' or alternatively a combination of CSI and a reality based cleaning show, this is defiantly a film for you. Right, Lego?